Newly published research shows regional climate variability caused an "unusual" period in which some of New Zealand's glaciers grew bigger, while glaciers worldwide were shrinking. The research, carried out by scientists from Victoria University of Wellington and the National Institute of Water and Atmospheric Research (NIWA), was published today in scientific journal Nature Communications. At least 58 New Zealand glaciers advanced between 1983 and 2008, with Franz Josef Glacier (Kā Roimata o Hine Hukatere) advancing nearly continuously during this time. "Glaciers advancing is very unusual—especially in this period when the vast majority of glaciers worldwide shrank in size as a result of our warming world," says lead-author Associate Professor Andrew Mackintosh from Victoria's Antarctic Research Centre. "This anomaly hadn't been satisfactorily explained, so this physics-based study used computer models for the first time to look into it in detail. "We found that lower temperature caused the glaciers to advance, rather than increased precipitation as previously thought. These periods of reduced temperature affected the entire New Zealand region, and they were significant enough for the glaciers to re-advance in spite of human-induced climate change." Associate Professor Mackintosh says the climate variability, which includes the cooler years, still reflects a climate that's been modified by humans. "It may seem unusual—this regional cooling during a period of overall global warming—but it's still consistent with human-induced climate change. The temperature changes were a result of variability in the climate system that's specific to New Zealand. "New Zealand sits in a region where there's significant variability in the oceans and the atmosphere—much more than many parts of the world. The climate variability that we identified was also responsible for changes in the Antarctic ice sheet and sea ice during this period." Associate Professor Mackintosh says they found New Zealand glaciers that advanced had certain characteristics, including specific elevation and geometry. "Franz Josef Glacier actually regained almost half of the total length it had lost in the twentieth century. However, Haupapa/Tasman Glacier, New Zealand's largest glacier—which has about a third of all of New Zealand's ice volume—continued to retreat. Because of that, New Zealand glaciers lost mass overall over this period." The study, funded by a core NIWA project 'Climate Present and Past', used computer modelling to understand the drivers of glaciers. The model was tested using more than a decade of field observations of glaciers in the Southern Alps, and a 30-year record of glacier photographs from the NIWA 'End of Summer Snowline' programme. Victoria University's Dr Brian Anderson and NIWA's Dr Andrew Lorrey were also lead authors on the study. Other authors include Professor James Renwick from Victoria's School of Geography, Environment and Earth Sciences, Dr Sam Dean, chief scientist for NIWA's Climate Atmosphere and Hazards Centre, and visiting student Prisco Frei from ETH Zurich. Dr Lorrey says the long-term observations that NIWA maintain—which document New Zealand glacier snow line changes and high elevation climate variability—were critical to achieving the aims of the study. Associate Professor Mackintosh says although glaciers advancing sounds promising, the future "doesn't look good" for New Zealand's glaciers. "Franz Josef Glacier has already retreated more than 1.5 kilometres since the end of the advance in 2008. 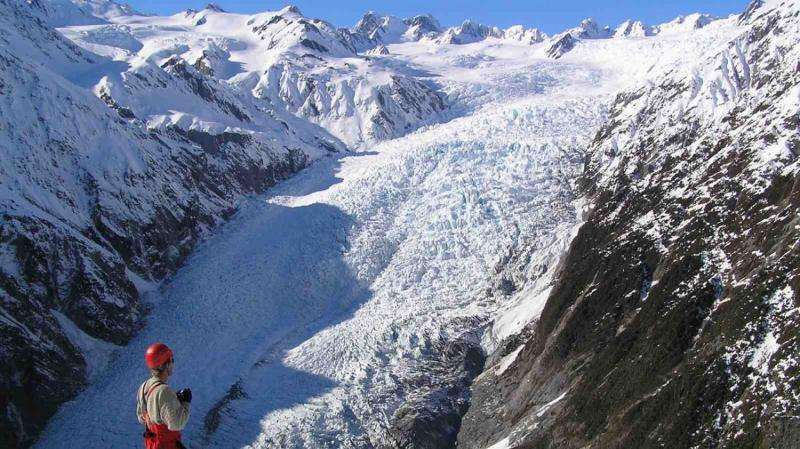 "New Zealand's glaciers are very sensitive to temperature change. If we get the two to four degrees of warming expected by the end of the century, our glaciers are going to mostly disappear. Some may experience small-scale advance over that time due to the regional climate variability, but overall they will retreat." But these guys don't believe their lying eyes, the glaciers have been growing but instead prefer to consider that they are all going to disappear. "It may seem unusual—this regional cooling during a period of overall global warming—but it's still consistent with human-induced climate change. The temperature changes were a result of variability in the climate system that's specific to New Zealand." So, if it cools it warms, if it warms it warms, - damn - I think we got a perpetual motion machine going here. Using my own eyes - the 30 year view in New Zealand is a transformation from glacial vistas to massive lakes surrounded by huge piles of moraine. Photo's and paintings from further back confirm a retreat has been happening as far back as we have a record. Are there models that factor in deforestation? Global, Local, Learn the difference. You're just totally making a fool of yourself with your super-naive thinking that because we have global warming we must have the exact same warming at every point on the planet. It's not your constant lying that's so irritating. It's the way you do it so stupidly. Pick up your game. get some education. Leading scientist confirm that the climate is chaotic, nonlinear and climate change is regional. There is no global temperature or global climate. The so-called global climate is a meaningless fiction. Therefore, to suggest that the globe is warming says nothing about regional realities like New Zealand, as some regions are getting colder and others are getting warmer. New Zealand is getting colder if glaciers are expanding. Also, the Antarctic region is getting colder. The coldest place on earth replacing Russia. Further, the Antarctic glacier has been expanding with 100 billion tons > of fresh ice annually. Natural climate variability over the past 11,000 years with surprises like the Medieval Warming Period and the Little Ice Age proves the climate has been clearly warmer in the past than it is today. This fact contradicts the CAGW theory based on the premise that human activity is making the climate unusually hot. The NZ glaciation is like past "climate surprises." When it is warm then you consider it global warming and reason to panic. When it is cold, you consider it a regional effect symptomatic of global warming and a reason to panic. BTW - look at some real ice data! Arctic = trend for coverage is still negative, but for volume has flattened. Some years are better than others, 2012 was bad, following years ice recovered. Too bad none of the models predict that variation. However, we only really have good data since 1980, as you many here like to tell us: climate is not weather- so is 10 years weather, what about 40? Antarctica: after some massive growth in the past few years things have calmed down a little and this year appears to be somewhat below average? Let me guess, that counts as climate for you?? Leading scientist confirm that the climate is chaotic, nonlinear and climate change is regional. There is no global temperature or global climate. The so-called global climate is a meaningless fiction. Erm...whut? Look up how these things are defined. Yes, they exist. Just you putting your fingers in your ears and going "lalala" doesn't make them go away. as some regions are getting colder and others are getting warmer. Selected regions can get colder as major ocean streams (or air streams) shift farther north or south or grow weaker/stronger. Global warming is NOT "all points will get 2°C warmer by date x"
No, it is not at all like a lottery. A lottery exists, it happens, and there is a definite outcome. Regardless of your believe, AGW is not a threat to humankind, its actions are not well understood, its outcomes are not well predicted. Regional events are SELECTED post-event as indicative (or not) of AGW. There are many terms for this, none of which are science. AGW is not a threat to humankind, its actions are not well understood, its outcomes are not well predicted. OK, you just contradicted yourself in the space of one sentence. If it's not understood (a statement that is totally wrong, BTW) - how can you assert that it's not a threat? Regional events are SELECTED post-event as indicative (or not) of AGW. No. Climate change predicts more extreme weather events. if you start to see more extreme weather events and an increase in heat records then that is a corroboration of the prediction. You don't really know how science works, do you? I mean, up to now we have established that you don't know basic chemistry, physics, or engineering. Instead of listing all the things you don't know (1000 characters don't suffice) why don't you tell us: what DO you actually know? Did you even finish high school? FactsReallyMatter Your user name explains why you are so prolific in your attempts to distort facts and where possible bury them under an avalanche of pseudo-intellectual pablum.